CALL NOW 262-248-3464 FOR CURRENT RATES. Each room has following amenities..
Area for playing basketball, catch ball, horseshoes, and more! Call us at 262-248-3464 to purchase or inquire about Gift Certificates for any occasion. We have many options available. View our rooms and cottages here. Overall experience was excellent. Better than other places. Be back with our boat again. I have stayed at this motel for over 10 years. Seen all changes being made, it has always been great for me. I stay here at least 3-4 times a year. I wouldn't spend my money here if it wasn't good place to stay. This is my 2nd time here this year and I will be back. Nice clean sheets, comfortable, Reasonable rates, landscape picked-up & clean, keep up the good work! I have been coming to this motel for many years and have always found it to be a gem for the money! The rooms are always very clean, and the staff go over of their way to help you! Always choose to stay here. People are always friendly, very comfortable & affordable. Every time i visit lake Geneva, lake Geneva Motel is my choice of stay!!! Good Location, Perfect Price, Cleanliness & Service is worth value for money. We have stayed here twice this year & yes we would like to stay here again. Best bargain, Ideal location & great for FISHING Trip. See you guys soon. Thank you for a wonderful time. Everything was great right down to the other guests on the property. Hope to see you again next year. This is our 6th time staying here. We feel like this is our 2nd home in Lake Geneva. We always tell our friends and family that go, to only stay at LAKE GENEVA MOTEL if you are in Lake Geneva. Perfect Price & Best Location; and on top of that, free coffee, free Wireless. What else do you need on vacation? We have stayed here more than 20 times and place keep getting better every day. Never feel like even looking for other place. It fits the budget and has it own charm. Good luck and have prosperous year ahead. Thank you again for everything you have done, our kids had blast...we will see you again same time same week next year. God bless you! Perfect Location, Perfect Price. Your service is THE BEST, we always feel welcome here. For us this is our mini resort. We were little hesitant to come to a MOTEL but we had a very good time. 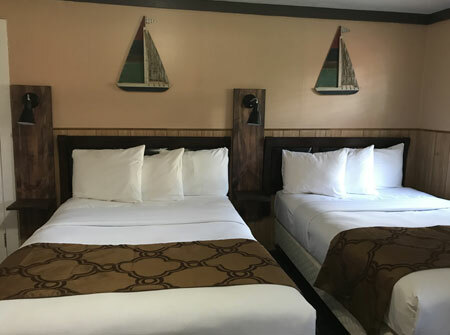 We have always stayed at hotel or Resort & but we wanted to save some money and one of my wife’s co-workers suggested we come here to Lake Geneva Motel and we are glad we did. There are so many things going on & we needed to get away; we will be back here again shortly. Manager is very friendly and place is very nice. I love this place. Best service, Best location, Best price. I'll be bringing my friends next time. I like this cute, cozy cottage. A grill, pool, walk to lake. Just perfect. I'm glad your place allows pets. Now I can come here more often. Away from city, work, phone ...Just me & my MAYA. Copyright © 2004-2019, Lake Geneva Motel. All rights reserved.